The Girls at 17 Swann Street is an emotional book about one woman’s struggle with anorexia. Anna’s time at 17 Swann Street results in new friends, challenges, and discoveries about herself. There’s something about The Girls at 17 Swann Street that stays with you after you finish the book. 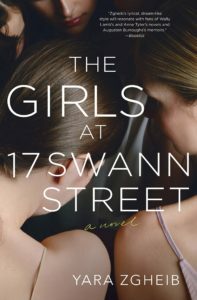 Whether it be the subtle ways Zgheib shows you Anna’s daily routine, or her dancing background, The Girls at 17 Swann Street takes you on an emotional roller coaster. I’m not sure about the accuracy of the eating disorder representation, but Zgheib gets to know the other women at 17 Swann Street. She sees their stories, their hopes, and fears. I liked the way Zgheib shows us, through assessments, and Anna’s daily routine, how she takes stock of her life. Whether it be her limited possessions in her room, or the way she does not have choice about her meals, Anna’s journey is challenging. The Girls at 17 Swann Street is full of memories of he past, like rooms with barely opened doors down a dim hallway. Her choices, her life, her routine is boiled down. Her conversations with nutritionists, therapists, and those around her, illustrate the way her life and choices has lead to this point. Through her memories and her interactions with her family, we see the warning signs, the flashing lights. All the moments that developed. The whispers gone unanswered. And the secrets hidden in dark corners, the gestures behind closed doors. Anna has this gripping fear of being inferior, of not being enough in her own skin, her own body. And the ways that her eating disorder gives her control. In the book, we are shown her memories from the past and we can see the ways in which she was made to feel inferior, that she took up too much space, from her ballerina history. In The Girls at 17 Swann Street we see a piece of her family’s experiences surrounding Anna. The way Matthias, her husband, tells the story of remembering memories differently. They both recount a trip and Anna’s memories don’t include the effects of her eating disorder, whereas Matthias reminds her about the darker side of some of their decisions. It’s a piece of a story of seeing someone you love suffer, of hidden thoughts under cold covers. Ultimately, no one can save Anna except herself. She has to decide if she wants to live, due to the severe undernourishment and health problems associated with her eating disorder. I appreciated that Zgheib didn’t take the easy way out and say that love can save someone. We have to choose to see those around us, to use their presence as our own motivation. They can help give us a light in the dark, but we have to reach out for it. Find The Girls at 17 Swann Street on Goodreads, Amazon, Indiebound & The Book Depository. Do you know of many other books with MC’s who struggle with eating disorders?